Caution - A fully-configured, unpackaged server weighs nearly 3700 lbs (1678 kg). Use six people to push the server up or down a ramp. Create a metal ramp long enough to cross small changes in elevation and strong enough to support the weight of the server. 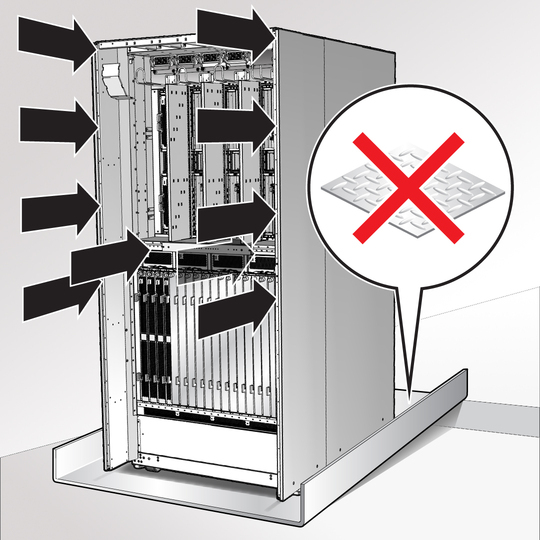 Note - The maximum allowable incline of an unpackaged server is 5 degrees (9% grade). Design a ramp long enough to achieve this incline level and strong enough to support the weight of the server. If you cannot achieve this 5 degree incline level, consider an alternate route to the installation site. Design a ramp that supports the weight of the server. Strong enough to support the nearly 3700 lbs (1678 kg) weight of the server over the entire span of the ramp. Be at least 48-inches (1220 mm) wide, or as wide as the passageway. Long enough to extend over the elevation and remain under the 5 degree (9% grade) maximum incline. Designed to ensure that the server does not fall over the sides of the ramp (for example, add railings, stops, or bend the edges of the ramp upward 90 degrees). Note - If the ramp has railings, cover these railings with heavy fabric to avoid scratching the surfaces of the server. Caution - Never use metal plates that contain tear drop or diamond patterns. These patterns can cause the castors to spin and make the server to move off course. Avoid using wooden ramps as they cannot support the weight of the server. The castors can have difficulty rolling over ramps coated with sticky or rubberized surfaces. Use additional people to push the server up or down ramps with these surfaces. See Raise the Leveling Feet. For instructions on removing a door, see Remove the Door. Position the ramp so that the server can successfully go up or down the elevation. Use six or more people either to push the server up the ramp or to slow the server rolling down the ramp. Push or slow the server along the edges of the server. With the rear door removed, one of the six people can move the server by pushing on either side of the rear LED panel. Caution - Ensure that the server remains on the ramp. If a castor falls off a side of the ramp, the server can tip over and damage the equipment and cause serious physical injury. After rolling up or down the ramp, remove the ramp and replace the server doors. For instructions on installing a door, see Install the Door.